Bud Ahlheim reveals several high-profile Christians who have endorsed the best-selling book Jesus Calling. The thing that’s most troubling about any Christian who touts the book is that doing so indicates a lack of spiritual discernment. What makes me say that? 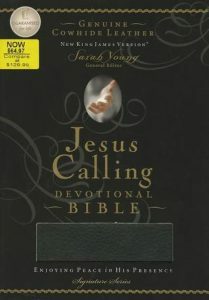 Because the author, Sarah Young, claims she hears directly from Jesus Christ and wrote down what the “Jesus” she channels allegedly said to her and shared it in a book. Popular blogger, author and book reviewer, Tim Challies, cautioned: “Jesus Calling makes the boldest, gutsiest, and, to my mind, most arrogant claim of any book ever to be considered Christian.” In a piece over at Pulpit & Pen, Bud Ahlheim lays out some of the problems with the occult book that has become a “tremendous blessing” and an “inspirational tool” to a large number of people — and not just professing Christians. Those who endorsed it include Catholics, New Agers, CEOs, musicians, entertainers, even secularists. Sometimes believers are blessed in our pursuit of obedience to God’s commands for discernment with what essentially passes as Berean no-brainers. Unlike those 1st-century Bereans who had carefully and cautiously reviewed Scripture to see if the things that Paul said were so, (Acts 17:11) occasionally it’s not necessary that modern believers have to do such detailed, prayerful Scripture study to discern truth from error. Sometimes we’re blessed with a list. We have been provided a list of high profile “Christian” leaders, writers, pastors, and celebrities who, by their endorsement of a well-known work of heresy are making the equal claim that they do not believe in the authority, sufficiency, and finality of God’s revelation in His Holy Word. They are thereby declaring that the Bible is incomplete, that God failed to say all He intended to say in it, and that there is at least one person on the planet today to whom He is still giving apostolic-like, continuing revelation. This, of course, is false and diabolically motivated. Here, then, is the list of those high-profile Christians who endorse the Montanist heresy that is Sarah Young and her Jesus Calling publications. The list is sourced from the promotional website JesusCalling.com. What makes a religion false? Did Hillsong Pastor Carl Lentz share the Gospel on Oprah’s show?